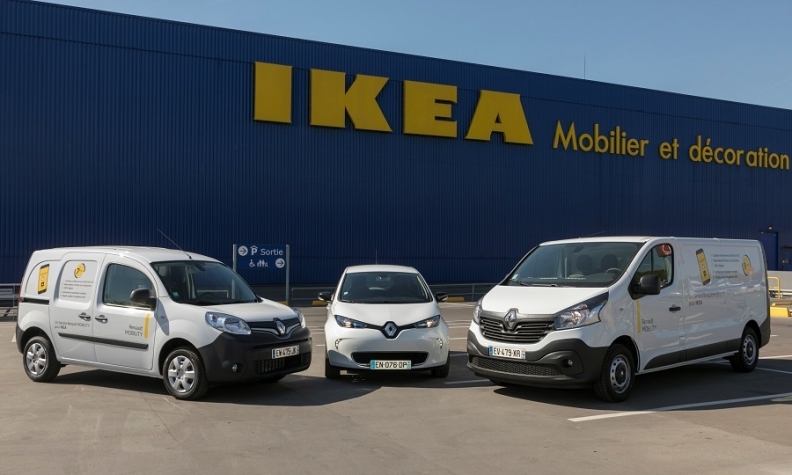 Renault is partnering with IKEA to offer EV verisons of its vans, the Kangoo, left and Master, right, and Zoe electric hatchback for short-term rental. 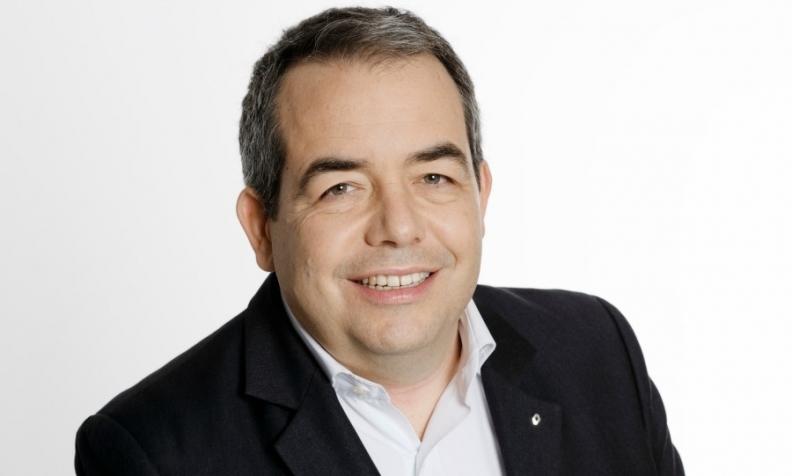 Eric Feunteun has been involved in Renault's electric vehicle program since February 2013, starting as deputy director. He was named director in March 2015. Renault has been the leader in European electric vehicle sales with the Zoe, introduced in 2012. Since then, the Zoe has received range and power upgrades, and Renault has introduced two electric commercial vans. He discussed the future of EVs at Renault Group with Automotive News Europe Correspondent Peter Sigal. Renault has introduced a more powerful R110 electric motor in the Zoe, with 225 newton meters of torque and 80 kilowatts of power. What are the main reasons for the upgrades? The first reason is that with the longer range battery we introduced last year [300 km or 186 miles of real-world range], we saw that buyers were using the car in a more versatile way. They were taking more highway trips, not necessarily from Paris to Spain but for weekend trips. The Zoe's torque at low speeds was good, but it could be improved at higher speeds to make passing easier. With the new motor, we have saved 2 seconds when accelerating from 80 kph to 120 kph. That is where you can feel the difference. The second part is that there is a trend toward more power for electric motors, because the cost of increasing power on an electric motor is not so high. We are the leader in electric vehicles, so we have to remain competitive. Were you able to keep the weight of the motor the same? Yes. The good thing with electric motors is that an increase of power and torque has little effect on the structure of the motor. Of course, increasing power has an impact on the amount of energy you have to deliver, but compared with what we have to do on an internal combustion engine to increase power, the changes are smaller. From a technical standpoint, what are the changes you can make to increase power? In broad terms, it's in the way we wind the copper cables, in software management, and the way we deliver the energy from the battery. Are the development costs for electric motors less than they are for traditional engines? When talking only about power, it's less. But we have to be careful because there are also effects on power electronics and delivery, and the battery. Car buyers are used to seeing a wide range of internal combustion engine choices for a single model. Will this be the same with electric vehicles? Right now, we have two power choices on the Zoe, 68 kW [with the previous-generation R90 electric motor] and 80 kW [equivalent to 107 hp]. We think having two offers at this stage is the right thing to do, but as volumes increase, we are likely to have more. Will the new engine be used in your electric vans, the Kangoo and Master? It will be used on the whole lineup, from Smart from our partner Daimler to the Zoe and Kangoo and now the Master. You just mentioned Smart. Mercedes wants to turn Smart into an electric-only brand, beginning with the United States. Will Renault continue to be a motorization partner? We are very happy today to supply the motor because we are looking to [increase] scale to reduce costs. It's a great asset to increase production. Our motor plant in Cleon, France, will double output this year compared with last year. With the full-size Master Z.E., Renault now has two electric vans but only one passenger car, the Zoe. Why the focus on vans? First, delivery and logistics companies have a strong need for a zero-emissions vehicle for operating in cities, where restrictions on diesel engines are getting stricter. In France last year, 8 percent of all Kangoos sold were electric, which is a lot considering that EVs accounted for 1 percent of total sales in Europe last year. The Master Z.E. came about because of pressure from the logistics companies, which wanted to have more cargo space than the Kangoo because they are delivering a lot of big but light Amazon-type boxes. They also needed access to city centers and to be able to make more night deliveries, which requires vehicles that are less noisy. The second thing is that logistics companies tend to have set routes, in which you know the mileage. So, you don’t have any questions about EV range – you know what it will be, plus or minus 5 km. For us, the electric van story started with the French postal system office, which ordered 10,000 Kangoo Z.E.s in 2011. It was a great way to democratize the technology, because when people see the letter carrier coming in an electric vehicle, that is very reassuring. They say, "This guy is a professional driver and he uses an EV." Did you have pre-commitments from customers to buy the Master EVs? There are about 10 key customers for the Master Z.E. We don't have formal agreements, but those customers have been involved in the development of the Master Z.E. The Master Z.E. was developed quite quickly. We took the powertrain of the Kangoo and put it in the Master through PVI, a company that we bought last year that specializes in electric conversions. We wanted to move fast, so the performance has some limitations in terms of top speed and autonomy. Range is about 120 km, so there are some choices we made. But we validated those choices with our customers. Eric Feunteun: "We are the leaders in electric vehicles and we do not want to give that up." Renault has started its "smart island" project in Madeira, Portugal, which is a renewable energy and EV ecosystem. What are your expectations? There are two strategies behind this project in Madeira, and a similar one in Utrecht, the Netherlands, which is a kind of "virtual island." The first message is that the renewable energy and mobility sectors are growing together, and they need to grow together. Renewable energy is produced whenever there is sun and wind, but the timing of the consumption is hard to match, so electric cars are becoming a way for the energy sector to grow renewables in a sustainable way. Five years ago, if you talked to an energy company they would say that electric vehicles will disrupt their network. Now, they are asking for more electric vehicles. In fact, the energy company in Madeira came to us because we are the leader in electric vehicles. The second message is that we will need to manage projects that involve lots of different technologies -- the car itself, a car-sharing system, smart-charging systems, renewable energy production and stationary storage. We need to learn how to package all this together to make it one program. The "smart island" will be scalable in other parts of Europe. Plug-in hybrids appear to be a good solution to meet CO2 targets. Are they important for Renault? There is no doubt that full electric is the destination. We expect our EV market share to reach more than 10 percent of our sales by 2022. The bigger question is whether that is enough to meet CO2 targets. We also know that some customers' usage is not compatible with EVs. That is a fact. For them we have the bank of technology of the Renault-Nissan-Mitsubishi Alliance, which offers plug-in hybrids. We will offer plug-in hybrids when they are relevant from a usage point of view, from a cost point of view, and of course from a taxation point of view – incentives play a big role. Just look at the example of the Netherlands, which had a tax break that encouraged plug-in hybrids, but now is supporting electric vehicles because the government changed its policy. Companies such as Volkswagen and Mercedes-Benz are announcing full lineups of electric passenger cars. Will we see similar announcements from Renault? If you look at our Drive the Future midterm plan, we will have a lineup of eight EVs by 2022. We will extend our segment coverage. We are working actively on the future – we improved the battery last year and the motor this year, and we will have more [improvements] next year. In terms of communication, our situation might be slightly different than our competitors, because we already have an electric vehicle business. When you do not have a current business, you have to talk about the future. We are the leaders in electric vehicles and we do not want to give that up.